In Tonquin a sort of Florentine flask is employed and the aqueous distillate is allowed to flow back into the still by means of a suitable tube. As a rule, the stills have a capacity of 3 piculs = 180 kg. of staranise. The distillation requires about 45 hours1) of firing. The yield of oil, computed as to fresh fruits, amounts to 3 to 31/2 p.c. (Radisson), according to another statement (Eberhardt) only 1,56 to 1,75 p.c. The oil is shipped in lead canisters of 7,5 kg. capacity, of which 4 are packed in a case. Composition. Anethol is the most important and valuable constituent of staranise oil. The determination of the congealing point reveals whether the oil is relatively rich in anethol or not. A more exact quantitative method for the determination of this substance is not known. Inasmuch as from 85 to 90 p.c. of pure anethol can be obtained from good oils by the freezing method, the actual content may be somewhat higher. Anethol was first recognized in staranise oil by A. Cahours2) who established the identity of the stearoptenes of the oils of fennel, anise and staranise. Somewhat later J. Persoz1) obtained anisic acid upon oxidation of the oil with chromic acid and named the acid thus obtained badianic acid. For the properties and derivatives of anethol see vol. I, p. 476. 4) The method of distillation is criticised by von Rechenberg, Theorie der Gewinnung und Trennung der atherischen Ole. Miltitz near Leipzig 1910, p. 458. 2) Compt. rend. 12 (1841), 1213. - Liebig's Annalen 35 (1840), 313. Fig. 36. 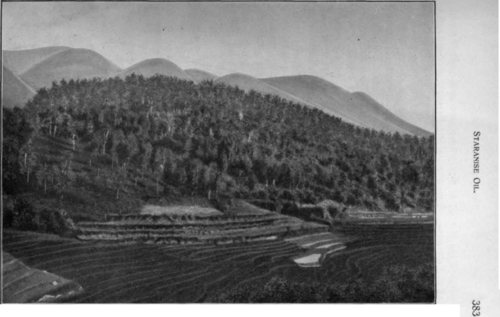 Plantation of staranise trees in the vicinity of Langson (Tonquin). The 10 to 15 p. c. of non-anethol constituents of the oil consist of a mixture of not less than a dozen distinct substances. The lowest fraction, boiling between 157 and 175°, contains several terpenes. 1. d-a-Pinene, b. p. 155 to 158°; aD + 24° 31' (m. p. of pinene nitrolbenzylamine 122 to 125o)2). 2. Fraction 163 to 168° had a distinct terebinthinate odor and the following constants: d15o0,8551; aD + 4°7'; nD20o 1,47343. Repeated attempts to identify B-pinene and sabinene by oxidation with permanganate in alkaline solution gave negative results3). 3. Phellandrene. In 1893, Schimmel & Co.4) demonstrated the presence of l-a-phellandrene in fraction 170 to 176° (aD - 5°40') by means of its nitrite (m. p. 102°). Somewhat later') a similar fraction yielded not only a- but also l-B-phellandrene (m. p. of semicarbazone of tetrahydrocuminic aldehyde 202 to 205°; m. p. of cuminic acid 113 to 115°). During a third investigation") the presence of d- B-phellandrene was also established. Hence three phellandrenes occur in the oil. Presumably all three occur together, but occasionally one or the other modification appears to predominate. 4. p-Cymene7) (m. p. of hydroxyisopropyl benzoic acid 156 to 157°; m. p. of p-propenylbenzoic acid 159 to 160°). 5. Cineol7) (m. p. of iodol compound 110 to 111°). 6. Dipentene8) (m. p. of tetrabromide 124°; m. p. of nitrol piperidide 153°). 7. l-Limonene8) (m. p. of tetrabromide 102 to 103°). 1) Compt. rend. 13 (1841), 433. - Liebig's Annalen 44 (1842), 311. 2) Report of Schimmel & Co. April 1893, 61; April 1910, 99; October 1911, 86. 3) Ibidem October 1911, 86. 4) Ibidem April 1893, 61. 6) Ibidem April 1910, 99, 100. 6) Ibidem October 1911, 86. 7) Report of Schimmel & Co. April 1910, 99, 100. 8) Ibidem October 1911, 86. 8. a-TerpineoI. According to E. j. Tardy1) fractions 216 to 218° or 218 to 224° are supposed to contain terpineol. By passing hydrogen chloride into two fractions boiling between 215 and 218° and 2\8 and 220° a good yield of dipentene dihydrochloride, m. p. 47 to 48°, was obtained. With nitrosyl chloride a smaller yield of a nitrosochloride, m. p. 113°, was obtained. With phenyl-/socyanate a urethane, m. p. 110 to 111°, was obtained which showed no melting point depression with terpinylphenylurethane melting at 111 to 112°. When oxidized with dilute permanganate solution, the corresponding glycerol was obtained which, when treated with chromic acid, yielded the ketolactone melting at 62 to 63°, the semicarbazone of which melted at 200°. 9. Methylchavicol (p-methoxy allyl benzene)2). If staranise oil is freed from anethol by means of repeated exposure to low temperatures to such an extent that no crystals separate in a freezing mixture, a limpid oil results which is greatly altered when boiled with alcoholic potassium hydroxide (Eykman's method). The boiling temperature rises, the index of refraction increases and, on cooling, large amounts of anethol are again separated. This has been formed by the action of potassium hydroxide on methyl-chavicol. 10. Hydroquinone ethyl ether, C6H4< H , is present only in traces and can be obtained by shaking out large amounts of staranise oil with caustic alkali. In a pure condition it consists of colorless laminae with a pearly lustre, melting at 64°. 11. Safrol. The probability of the presence of this substance was demonstrated by F. Oswald3) who, upon oxidation with permanganate, obtained a substance that melted at 35 to 36° and had the odor of piperonal. Schimmel & Co.4) proved its identity by converting it into the piperonal semicarbazone melting at 224 to 225°.